At the end of November LEAD! was able to try out its principles and methods in the context of a professional orchestra for the first time. The aim was to develop the leadership skills of aspiring young leaders and work on communication skills and sound in an orchestral environment. For this, LEAD! invited five talented musicians from different parts of Europe: Oleh Kurochkin from Ukraine, Emma Mali and Essie Hoglund from Finland and Izabel and Lora Markova from Bulgaria, as well as two cellists studying at the Bulgarian National Academy of Music – Momchil Pandev and Alek Canov. During an intense four-day rehearsal period, supported by Jukka-Pekka Saraste, the LEAD! 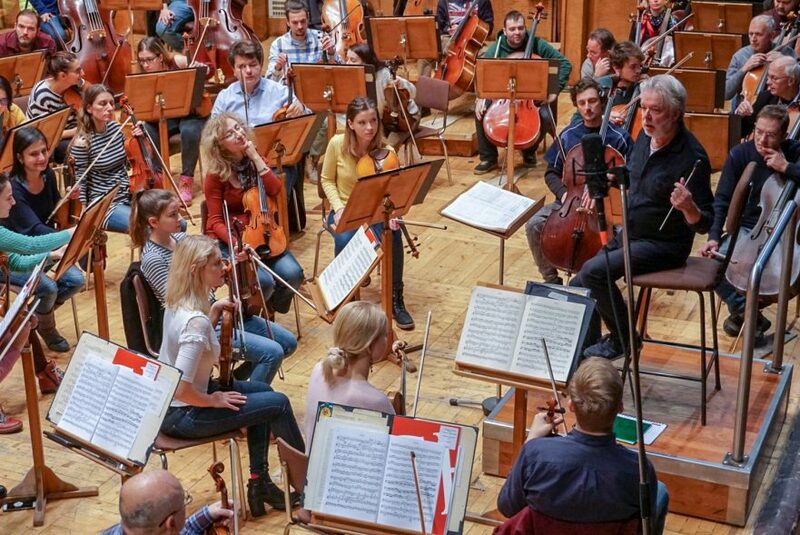 mentors Tero Latvala, Sasha Zemtsov and Franz Bartolomey and by the leaders of the Sofia Philharmonic, the young musicians took turns leading their sections and were mentored on all aspects of their roles. The results exceeded all expectations. An enriching learning context was developed in which an exchange of knowledge and skills at all levels took place. The young musicians grew into their roles and rose to the challenge, leading the sections of the Sofia Philharmonic in a moving concert with music by Stravinsky, Mozart and Sibelius under the baton of Jukka-Pekka Saraste.